The 3M 96″ by 48″ widescreen dry erase board is truly a large whiteboard! At 8 feet by 4 feet (32 sq ft) this dry erase board can nearly cover an entire wall. In addition to the enormous size, 3M has given this white board an elegant trim that makes this one stand out. The surface on 3M’s board is the industry standard melamine surface. Although these surfaces are sometimes referenced as “not top of the line”, they will last for years if properly cared for. In addition, the lower price on this whiteboard is a result of the melamine – a ceramic board of this size would be much more expensive. 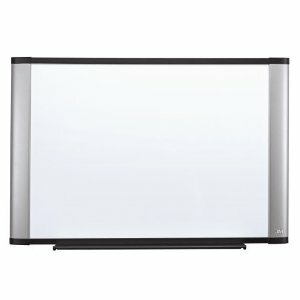 3M’s large dry erase board has a unique styling that gives it an almost “theater” like appearance. The wings of the board are done in a wider than average aluminum finish with the top and bottom in a thinner and black colored finish. There is also a dry erase marker tray that attaches to the bottom of the board in the center region. Some customers have mentioned that attachment can be difficult with 3M’s included brackets and attachment points. The experience varies, and at this price it may be worthwhile to consider it a part of the cost savings. Generally, the attachment points have to be very carefully aligned in order for the whiteboard to be hung. 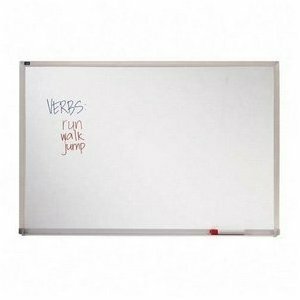 Whiteboards that are this large are great for group brainstorming projects or even the lone individual that has a lot to get written down. Although this board is usually used in a horizontal position, you can also hang the board vertically and use it as a 4′ by 8′ board with a longer vertical aspect. Another possible use of this whiteboard is for doubling up as a projector screen. The large size means that it will work for many projectors and can double up as a whiteboard during, and after, the presentation.